Is a new studio set up at the recently redeveloped Ruskin Glass Centre in Stourbridge by Ian & Vic Bamforth, Stephen Foster and Pete Fricker. As partners in the new venture they are proud to be located at this historic site with its rich heritage of glass-making, and excited about contributing to a new chapter in Stourbridge glass. The partners, all formerly students of Dudley College’s International Glass Centre, are looking forward to using the new studio to realise their ideas and develop pieces that reflect their individual styles; their work is available to purchase direct from the studio. It is available for hire to other glassmakers at competitive rates. 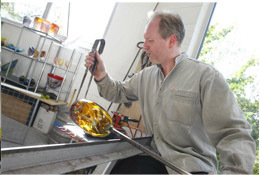 There are also plans to offer glassblowing courses early in 2011. So whatever your interest in glass, as maker or student, visitor or buyer, you are most welcome. Commissions, private and corporate, also undertaken.